Henri Goutorbe Champagne is a family run Grower Producer in the village of Aÿ, with 22 hectares of Vines including 10 in Aÿ, and the rest in Mareuil-sur-Aÿ, Mutigny, and Bisseul with a few parcels in the Sezannais and the Aube. The wines are 25% Chardonnay, 70% Pinot Noir and 5% Pinot Meunier, and they produce 10,000 cases a year. All wines undergo malolactic fermentation and stainless steel is used exclusively for fermentation and storage. The wines are simply big in flavor, ripe, and very tasty - this doesn't mean they are just fun things to drink as they are serious wines as well. Importer Terry Theise says "they seem never to have had an off-vintage" and also comments on "they are sumptuous and full of fruit" and I concur wholeheartedly. René and Nicole Goutorbe, the late Henri's son and daughter in law, run the estate together with their children Elisabeth and Etienne. They also run Hotel Castel Jeanson in Aÿ, very near the winery and exactly where you want to stay in Aÿ - near everything, and recommended by many. Although Henri Goutorbe Champagne has existed a scant 60 years if that, the Goutorbe family's work with Champagne goes back to Emile Goutorbe who was the vineyard director at Perrier-Jouet after WW I. as well as a a nurseryman. Henri himself began as a nurseryman and became a leading supplier of grafted vines. Emile and Henri started producing wine together shortly after WW II, and when René joined in 1970, there was an increased concentration and recognition on Champagne production instead of nursery work. Should you visit, they have a lot of older vintages available back to the 70s for sale. Henri Goutorbe “Cuvée Prestige” Brut, N.V.- Their entry level Non Vintage wine, and usually 70 percent Pinot Noir, 25 percent Chardonnay and 5 percent Pinot Meunier. Henri Goutorbe Millésime Brut - Their basic vintage wine, tasting note for the 2002 below. 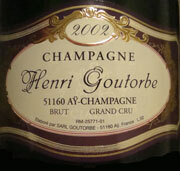 Henri Goutorbe “Special Club” Brut - A lovely bottling, and a tasting note will be forthcoming. Lots of tiny bubbles and a light golden color. The nose is apple, honey, orange and orange peel. On the palate this is creamy, very rich, and smooth, with spicy apple, cinnamon, and candied apples. Very lovely, and very young. Very elegant and very full-bodied. Very very. Improved significantly with air and it started off very good too!